An aspect of interest concerning the in situ pavings is the matter of their analysis, in regards as to what angles the pentagons actually are, as well their possessing a interesting condition of collinearity that the subsidiary hexagons possess, the latter as noted by Robert H. Macmillan in his paper ‘Pyramids and pavements: some thoughts from Cairo’, in the Mathematical Gazette, December 1979, pages 251-255, a first-hand account. This study thus examines both of these aspects, of which in a sense they are to a certain extent intertwined. He then gives a mathematical explanation, in which he gives a pentagon with angles of 108° 26’ and 143° 8’ (I disregard the fixed angle of 90° here, as well as the figures repeating twice), albeit his presentation is not ideal, in that the diagram shown, Fig. 4 does not show this aspect, as well as there being no in situ pictures with overlays showing collinearity. (Simply stated, I now believe Macmillan is referring to a possibility of such an occurrence, and not holding Fig. 4 as an exemplar. This is the crucial aspect. Therefore, the diagram is not in error per se.) Essentially this thus sets the scene for collinearity, in which such a feature is established, if not entirely illustrated satisfactorily by Macmillan for reasons as above. 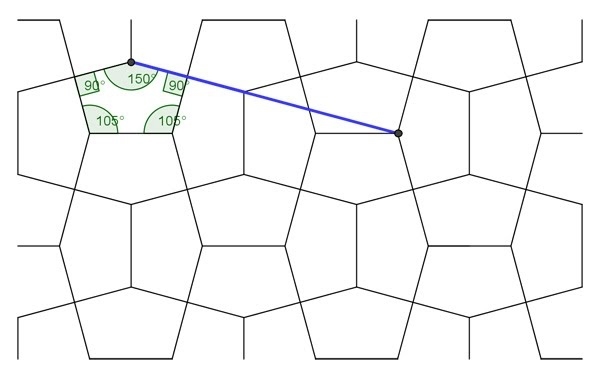 Of interest, without actual evidence, is thus to substantiate this claim, of which I examine the in situ tilings to see if this collinearity is indeed a feature, by the simple process of overlaying such lines and seeing if these are indeed collinear. However, although at first glance the task is complicated somewhat, given that the tiles in the in situ pictures differ considerably as regards format and colouring, much of this can be dismissed as irrelevant. Broadly, I differentiate two different types, of single pentagons and of pentagons in a square matrix. Both examples have colour variations. The single pentagons are in black, white, yellow and red, whilst the square format example are dull yellow, dull red, and a plain grey, the latter likely left being the same type as the ‘colours’, but left uncoloured. Furthermore, much of the colour variations are trivial, for example the square matrix tiles are arranged in stripes, of different unit thickness. Also, different colouring arrangements can be observed for the single pentagons. However, such colouring is an inconsequential matter here, in that it does not play a part in the analysis. What is important is determining this is the inherent distinctness of the tiles. Obviously, with single pentagons and square matrices these are obviously different. However, one could just possibly forward an argument that the plain grey is of a different type, despite the like format, and so for analysis purposes I include this as well, giving three types. Furthermore, due to the tiles being actual physical objects (rather than the geometer’s theoretical lines), and with these being put in place not necessarily with the strictest degree of carefulness as regards the ‘perfect alignment’, especially of the square format type, the task of determining collinearity is thus made more difficult. Indeed, it can be seen that in some instances the proposed ‘correct’ collinearity is not seen, for this very reason. Therefore, one could thus quibble at being categorical here as to the existence of collinearity. However, as the individual coloured pentagons are placed (of necessity) considerably more accurately, from which one can then surmise the collinearity condition. 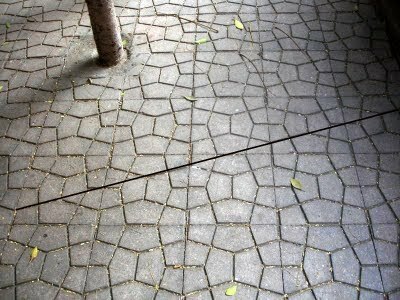 Another matter for consideration is the slabs’ composition. Of note is that the slab is not of a ‘minimum’ configuration of a single unit (1 x 1) cross; as it consists of essentially a 2 x 2 ‘mini array’ of reflected crosses, with appropriate ‘joining’. Although one could indeed compose a tiling with a 1 x 1 cross, this would also involve a second, reflected tile, and so likely for ease of tiling the 2 x 2 mini array is chose for the sake of convenience, in that a single tile can be used, and then simply placed adjoining in the same orientation each time (although on occasions such niceties are not observed; where the tiler has placed the slab incorrectly, as it has two different placements). 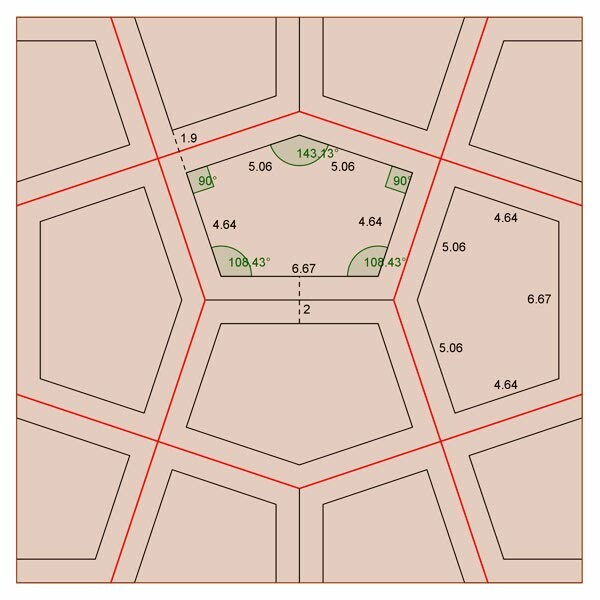 Figure 5 shows a idealised slab of a 1 x 1 array, with a central cross with idealised grooves ‘emanating’ from this, based on a 12 x 12 unit, scaled up from a 3 x 3 unit (to use the intersections of the larger scale, something which a 3 x 3 unit lacks). 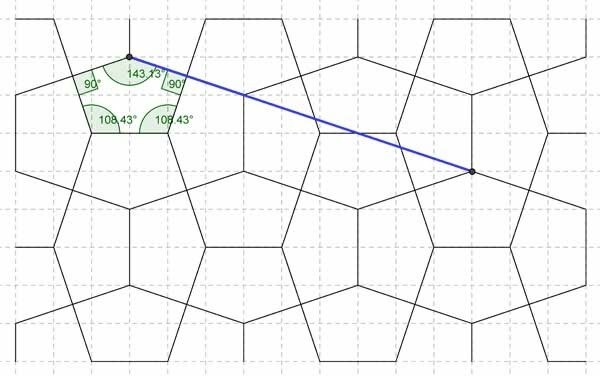 One interesting aspect here is that the sides of the resultant pentagons are no longer of (four) equal lengths, but of two different lengths (4.64 and 5.06 units). Also, by following existing underlying grid lines, there is a slight difference in unit thickness of grooves (1.9 as against 2.0 units), which could easily be overlooked at a casual glance; indeed, this is almost imperceptible without measuring. Figure 6 essentially builds on Figure 5, in which this takes the 1 x 1 slab and extends this (by translations) to show a 3 x 1 array (to enable collinearity analysis), with specifications as above. 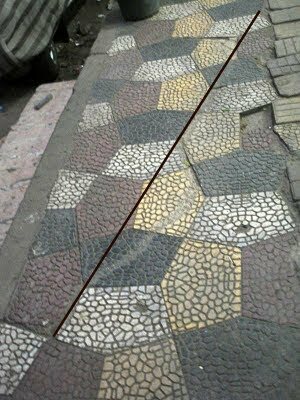 Each idealised consecutive paving slab is shown shaded, to more easily identify each element. To this composition I now examine it for collinearity. As can be seen, the basic premise of ‘nearest neighbour’ collinearity remains. From this, one can in hindsight why this must be so; there is no change made to the central stick cross, and as the central stick cross possesses collinearity, so must it ‘disguised’ neighbour, in the form of grooves. Simply stated, the grooves are to be regarded as decoration. Whether they are of unit thickness, or half, or quarter size, or whatever, it is of no consequence, so long as they are based upon a central stick cross, the premise of collinearity remains, no matter what combination of thickness is given. As can be seen, each of the three types (Figures 1-3) does indeed possess collinearity, as outlined by Macmillan. Therefore, at face value, it would indeed appear that the in situ tiles are as given by Macmillan, with angles of 108° 26’ and 143° 8’. Indeed, indisputably, he sets out a ‘fair case’ for the pentagons as to exactly the type and angles they consist of, almost beyond all reasonable doubt. However, this finding is not necessarily so! 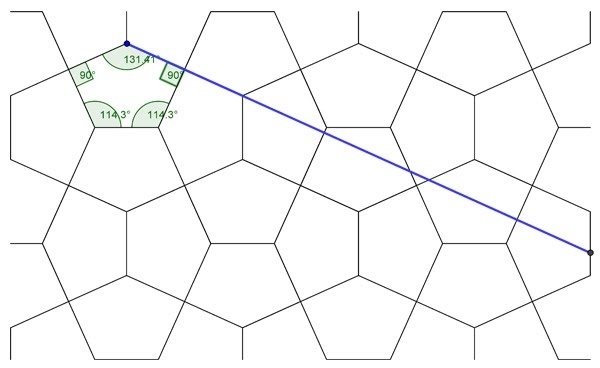 An alternative argument can also be for in situ tilings with tiles based on squared intersections. The example below of a square intersection type, of a 3 x 3 format, but can be scaled up, with 6 x 6, 9 x 9…), with a like collinearity, shows a tiling of a remarkably like appearance, with angles of 108° 43’ and 143° 13’ (as against Macmillan’s 108° 26’ and 143° 8’). For the sake of brevity and ease of reference, the two pentagon types here are referred to below as by Macmillan and Bailey. I might just add that I’ve examined larger formats, up to 12 x 12, and this is the only other example of collinearity I have found. Furthermore, in favour of this conjecture is that such square-based intersections are by far the easier construction; indeed, childlike in ease of drawing. Could one not suppose that the designer opted for the most obvious and easier option? An open question therefore is if the in situ tile is indeed of a pentagon as described by Macmillan, or as described by Bailey? 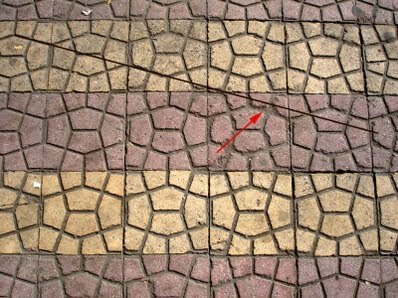 An open question is to whether this extremely fine difference is discernible when actually measuring the in situ paving with a protractor, with at best likely half degree measures? As such, I very much doubt it. Also to be considered is the practicalities involved measuring physical objects (rather than a theoretically easier geometric diagram). Also causing practical difficulties is the likelihood of necessity of measuring with a likely small size protractor. Furthermore, given the two types of pentagon this can also cause problems. The square format can be seen to have noticeable wide grooves which would militate against such an exact measurement of the angles, at least to such fine amounts as described. 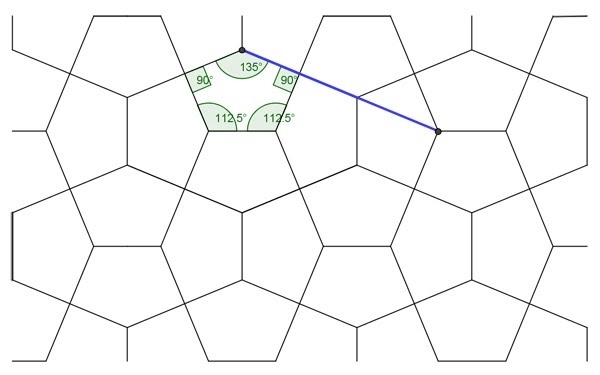 The single pentagons would appear to be a better choice to measure, being in theory of a theoretical line. All this must militate against the necessity exactitude. Indeed, as an abstract argument, even with a computer drawn printed out line drawing of pentagons of the same scale with angles of 108° 26’, 143° 8’ and 108° 43’, 143° 13’, I doubt very much that such fine discernments in practise could actually be measured with a ‘normal’ protractor. Consequently due to the above, I now have serious doubts as to the certainty of Macmillan’s claim; either of the two possibilities given would appear possible (if not of others as yet to be discerned). As such, with the collinear feature now firmly established, with all the in situ pictures possessing this feature, there can be no doubt whatsoever that the in situ pentagons were designed with collinear aspects in mind. Furthermore, as a corollary of this, as the commonly quoted examples of the equilateral or dual as being the Cairo pentagon do not possess collinearity, they cannot thus be the in situ pentagons! Therefore, having established the collinearity principle, the one aspect remaining unresolved is to the exact angles of the pentagons. Although it might be thought that Macmillan has established this definitively, I now have doubts, in that I have shown in my studies that there is at least a second possibility. Indeed, one could put forward a case for this as being more likely, given its sheer simplicity of construction, as against Macmillan’s more mathematical example. An open question is to how he arrived at his angle determination; was it by seeing the blueprints, measuring or by mathematical argument alone? It would seem doubtful to say the least that he would have access to the blueprints or could indeed measure sufficiently accurately enough with a protractor as to the angles given. Therefore, it would seem likely he arrived at this purely mathematically. Therefore, if the latter, as would seem likely, he seems to have missed this alternative possibility. 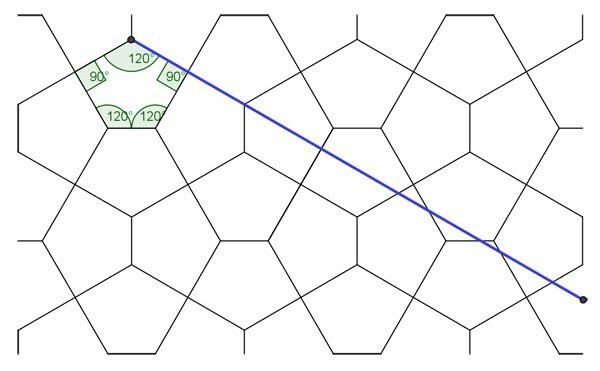 … the reciprocals of the tessellations 32. 4. 3. 4 and 34. 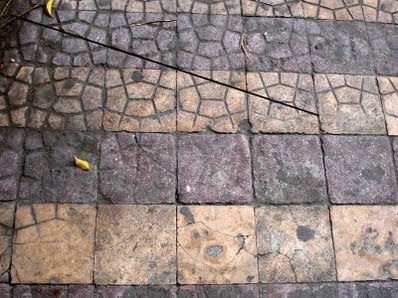 6 are patterns of congruent pentagons such as often used for street paving in Moslem countries. … and this is in fact the proportion often adopted in Cairo…. The operative word here is often, when he could have stated always. This suggests the possibility of variety. But perhaps I am reading too much into this choice of word; was this just a throwaway comment? It would now appear likely, given that there are no sightings of such types, and of the prevailing collinear types. Of note is that the in situ pictures are likely of same pentagon throughout, of either the Macmillan or Bailey types, albeit in two different formats. What could explain this dichotomy? Likely, the above sentence, of a relatively lightweight nature, was just a relatively throwaway comment, this being in nature of decidedly less exhaustive account than with the 1979 paper. Therefore, I find it highly unlikely that these two reciprocals (duals) are to be found. But that said, why would Macmillan refer to these if he had no evidence? It’s all rather mysterious.